An autumn treat is in store for the many local blues and rock fans as our very own Steve Walwyn brings the feel-good factor back to the Leamington Assembly for another pulsating night of R&B on Saturday 6th October. The bands shows at the venue back in 2011 and 2014 were both my gigs of that year and of course they have also performed locally at venues such as The Royal Spa Centre, The Zephyr Lounge and Cox’s Yard in Stratford and they are one of the hardest touring bands around both in the UK and Europe. A classic four piece line up with Steve on amazing lead guitar now getting close to 30 years with the band, a power house rhythm section of Phil Mitchell (bass) and Kevin Morris (drums) and last but not least one of my favourite frontmen around Robert Kane supplying the red hot vocals along with his wonderful stage presence and showmanship. They have such a back catalogue of vintage Feelgood numbers, later compositions and their very own takes on classic R & B tunes, always give 100% and a rocking night is absolutely guaranteed. 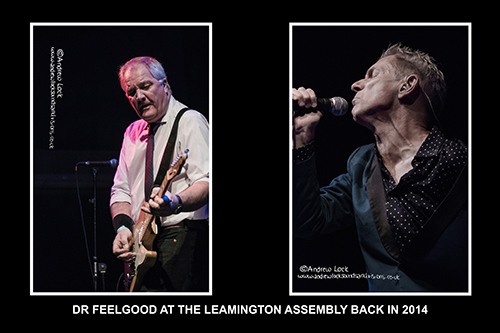 Below is my web site review of that incredible show at The Assembly back in 2014 to give you a taste of what to expect while the photos are a few of my shots from the same gig. The last time this two band bill played this venue back in 2011 it was it was my gig of the year and they have gone and done it again. Both bands are classic 4 piece, all action line-ups with dynamic guitar work, rock solid rhythm sections, the distinctive sound of the harmonica and top R & B numbers and the hall was rocking from the start of the night to the last notes of the Dr Feelgood set. Nine Below Zero were first up on this night of high energy R & B with crackers like the frantic paced ‘Tore Down’, the fun of ‘Homework’ the bluesy ‘Ridin’ On the L&N’ with it’s fabulous steam train style harmonica intro and bouncing covers ‘Rockin’ Robin’, ‘I Can’t Help Myself’ and ‘Wooly Bully’. A big show this one for Dr. Feelgood with local boy Steve Walwyn on guitar and they exploded on stage full of energy with ‘All Through the City’ and proceeded to turn up the heat to scorching point with classic after classic as they rocked through the likes of ‘I Can Tell’, ‘Baby Jane’, ‘Milk and Alcohol’, ‘Back in the Night’, ‘Down at the Doctors’ and ‘She Does It Right’. Vocalist Robert Kane is for me one of the best front men around, a true force of nature who never stops moving, at various points in the set he crawls over the stage floor and leans right over the crowd geeing up the audience and to go along with the showmanship he has a fabulous R & B vocal style. Mr Walwyn one of the true gentleman of the music scene as always knocked them dead on the six string including a display of top slide guitar. The only break in pace was for the magnificent slow burning ‘Down By the Jetty Blues’ which gave everyone a chance to take a breath but only then to marvel at Steve’s amazing solo. Finishing in pulsating style with ‘Going Back Home’ and ‘Gimme One More Shot’ this was as close to a perfect night of R & B as you could ask for, not a dull moment in either set, outstanding musicianship, quality sound, ageless tunes, a pumped up crowd and very importantly plenty of fun.